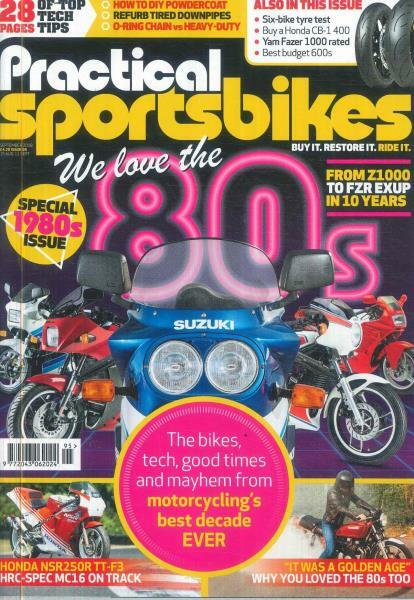 Practical Sportsbikes magazine is about buying, improving, restoring and riding the best motorbikes from the 1970s, 80s and 90s. Practical Sportsbikes magazine foscuses on the buying, fixing and riding of some of the most iconic sportsbikes from the 70's, 80's and 90's. The articles cover everything you could imagine about these great motorcycles, with how to guides and tips, alongside buying guides and restoration projects. Practical Sportsbikes is a hands on guide for the sportsbike enthusiast and speed freaks out there. Buy a subscription with Unique Magazines and never miss an issue. As an ageing biker the magazine is excellent and addresses bikes from my lost youth, as well as being informative and helpful with my current restoration.